Our guide for the next 4 hours (although the drinks afterwards extended it for at least another two) was the effervescent Blanca, a Catalonia native from the Delta Lebre in the south, and someone who was possibly as nervous as she was excited. She exuded real passion, charm, and knowledge and kept the tour rolling along and us smiling all the way. Without giving too much away we started in the wonderfully decked out Òsties Pedrín, a Catalan restaurant right next to the Boqueria market for a selection of nibbles with a traditional vermut. Their strap line tells you all you need to know, Cuina de la Barcelona a la Boqueria, the Kitchen of Barcelona’s Boqueria. We did some introductions and Blanca began to tell us about the foodie regions of Spain and about the all important hora del vermut, traditionally a time on Sundays when you go for an aperitif with friends before the family lunch, but what now seems to encompass pretty much anything at any time. After getting to know each other we headed out and into the Jardins de Rubió i Lluch that house the Library of Catalonia and a couple of educational establishments. After more historical tidbits we continue through the Raval neighbourhood stopping to look at the local street art along the way. Our next stop is a little restaurant that you’d be unlikely to enter. It doesn’t look much. But this place has been serving the locals for over 40 years and the reason is clear to see. Old fashioned interiors and traditional tapas give you a real sense of years gone by. And the owner has a penchant for the odd radio too! 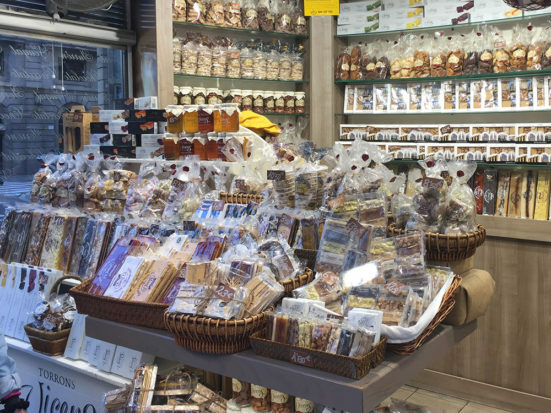 Back to the Ramblas for a tasting of the typical Spanish Christmas confection, turrón. It can be hard, soft, and even marzipan-like and comes in rectangular bars often containing nuts. Very sweet and perfect for gifts for those without false teeth. 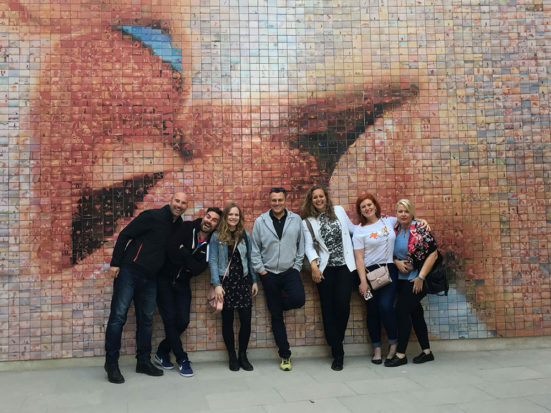 Thankfully off the Rambla again and into Plaça d’Isidre Nonell, we admire the ‘kiss of freedom’ mural on one side. 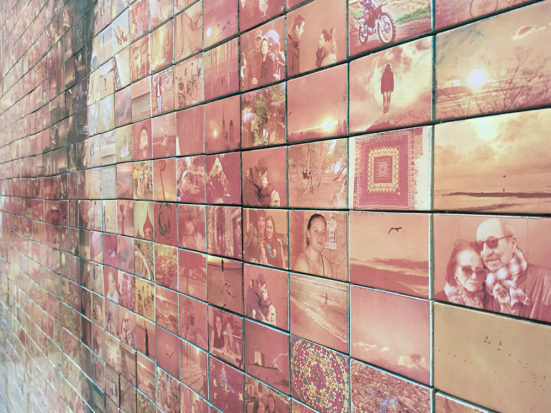 This photomosaic by Barcelona-based photographer Joan Fontcuberta was created from thousands of pictures sent in by readers of the El Periódico newspaper. Completed in 2014 the endeavour was to interpret each person’s idea of freedom. The mural is part of the Third Centennial of the siege of Barcelona in 1714. It’s fascinating looking at a each little photo in detail and even more extraordinary when you step back and see the mural as a whole. A brilliant piece of work! We walk into the cathedral square. With the sun setting on the cathedral itself it really is beautiful. 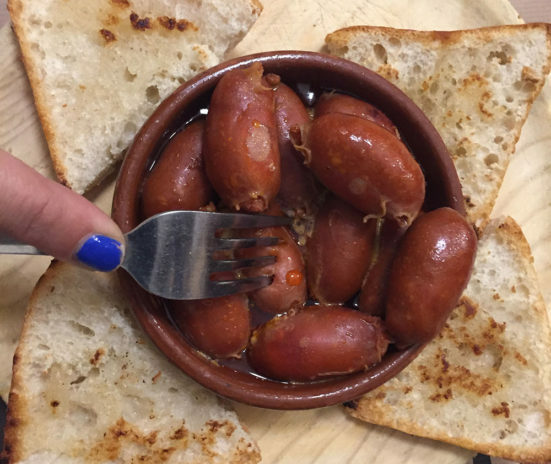 Into the narrow streets of Barri Gòtic we stop to buy churros, another traditional sweet that’s like an elongated doughnut, and then head to a tucked-away little cafe where we dip the churros in 3 different flavours of hot melted chocolate. 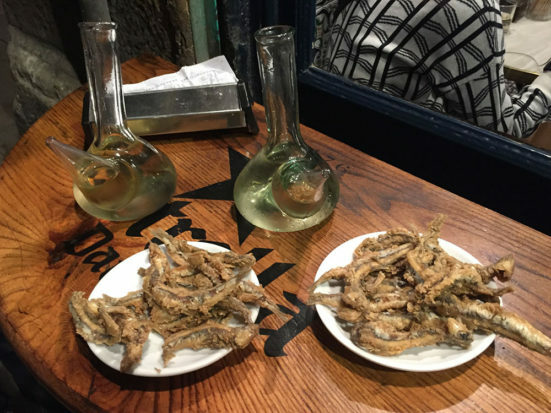 On to one of my favourite little bars, Bar La Plata, for pescaditos fritos and a lovely white wine served in a traditional porrón. 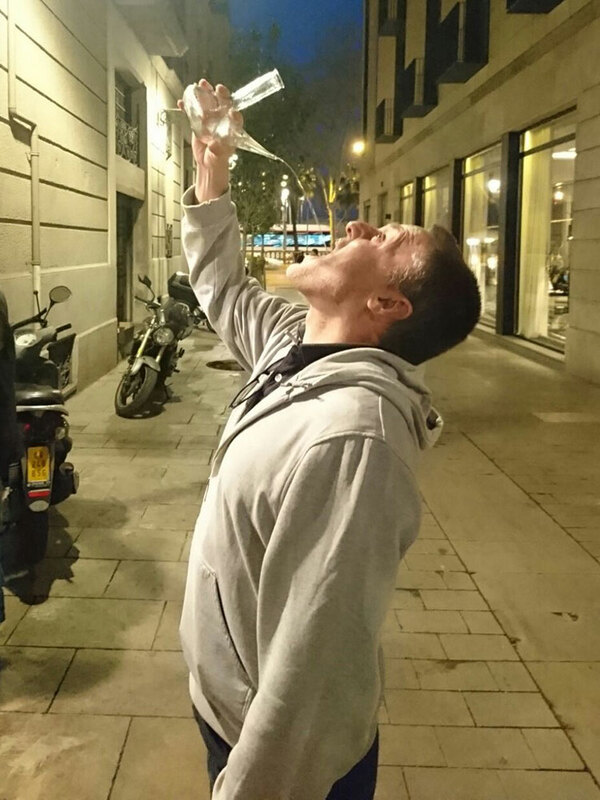 A porrón is a glass, watering-can type vessel, the idea being that you tip your head back and pour the wine into your mouth gradually moving the porrón away from your mouth and then back again. Great fun! And of course a little spillage on your chin the first few times is hardly de rigueur but certainly adds to the fun. And my effort. Not a drop spilt, promise. We end at a 1600s bodega, one of those little gems in a city that without being told about you are unlikely to venture into. A small wooden door that’s part of a much larger one takes you into a cool, lowly-lit bodega, the shelves lined with the clay jugs that were, and I’m sure still are, used to age wine. We are offered a delicious selection of meats and cheeses, a fabulous red wine which by now had to be something special to be appreciated, and finish off with a traditional crema catalana dessert – similar to a crème brûlée but lighter and just as delicious. After a few optional extra glasses at a local bar we part company. It has been a wonderful afternoon and evening. Great food, great company, a real delight! 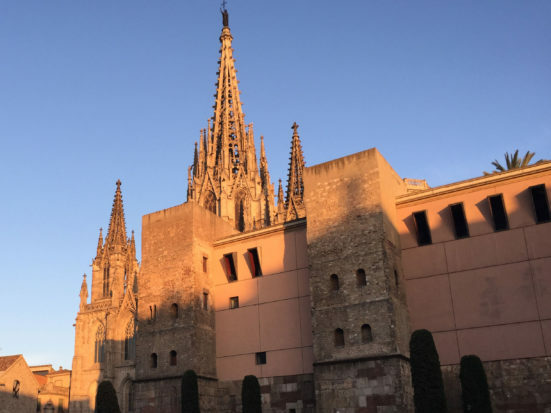 What’s so interesting about many of these tours in Barcelona is that you are surrounded by so much history that walking from place to place you are treated to a guided experience that never fails to fascinate. And it doesn’t matter how many tours I go on, I always learn something new. 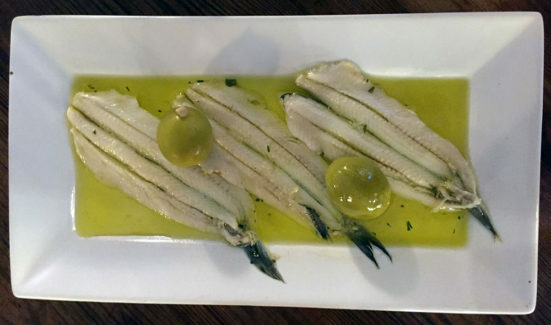 And the Wanderbeak Savor Spain tour is no exception. This food tour has it all. A great guide, lots of little gems of information along the way, and of course, fabulous food, more than I have had on any other tour. I’d encourage you to give it a go, whether you’re visiting or are here long-term, I guarantee you will have a wonderful time! To find out more about Wanderbeak and the tours they offer visit their website at www.wanderbeak.com. Wonderful tour with Blanca from Wanderbeak Tours. We had four hours of so many tastings. It was a great evening and Blanca was a true delight. Her English is great, and she was enthusiastic and knowledgeable. We visited some very interesting restaurants and the tastings and drinks were plentiful. Come hungry and ready to eat and to walk. It was both a historical walking tour and a food tour. Highly recommend it for adults who enjoy learning about food. Just had the BEST tour with Blanca. She is beautiful inside and out. We had so much fun with her. I absolutely loved how knowledgeable she is about the city and the culture. Would highly recommend this tour. Had a great Savor Spain tour with Blanca. Very knowledgeable and her personality was awesome. Answered all of our questions and ate some great food. Highly recommended!